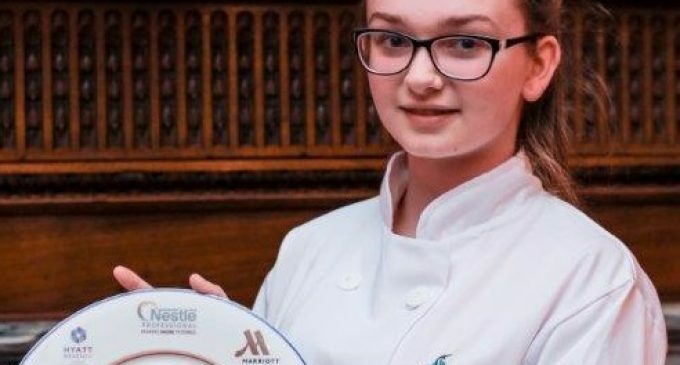 A 15-year-old school girl from Glasgow has been selected as the latest Futurechef candidate to make it through to the competition’s national final. Courtney McDowall (pictured) beat nine other young chefs at the Central and South Scotland regional final, held at City of Glasgow College earlier this week. Annabelle Ewing, Minister for Youth and Women’s Employment, said: ‘The industry-led Tourism Strategy 2020 recognises that skilled and enthusiastic people are key to delivering success. Springboard’s FutureChef is a culinary initiative which aims to assist young people aged 12-16 to learn cooking skills and understand nutrition, as well as providing an insight into and inspiration for building a career within the hospitality industry. Delivered in over 550 schools nationwide, the 2016 contest culminates on 14th March, with the national final at Westminster Kingsway College in London.